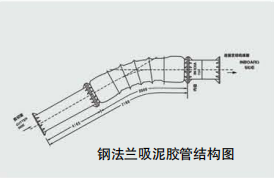 Flanged dredging hose meets the need of long-distance transmission of hydraulic oil in large coal mines, and has a very good application and development prospects. 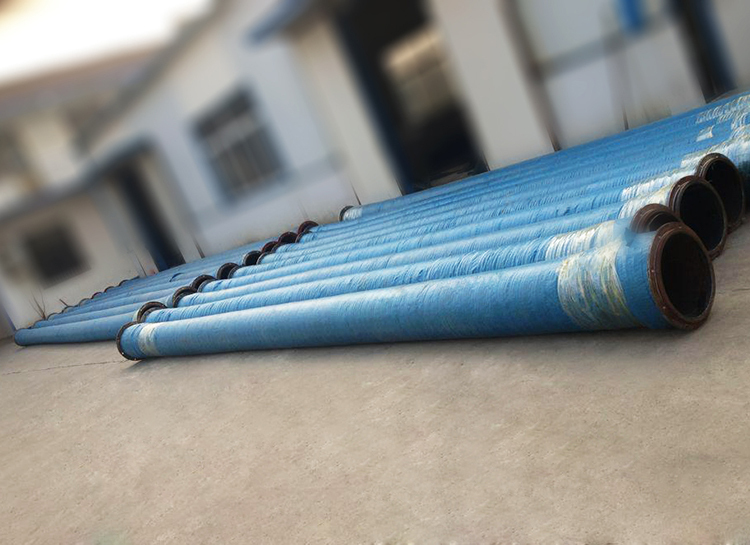 Pressure of flanged dredging hose: The specified working pressure of flanged dredging hose is not less than the system pressure. 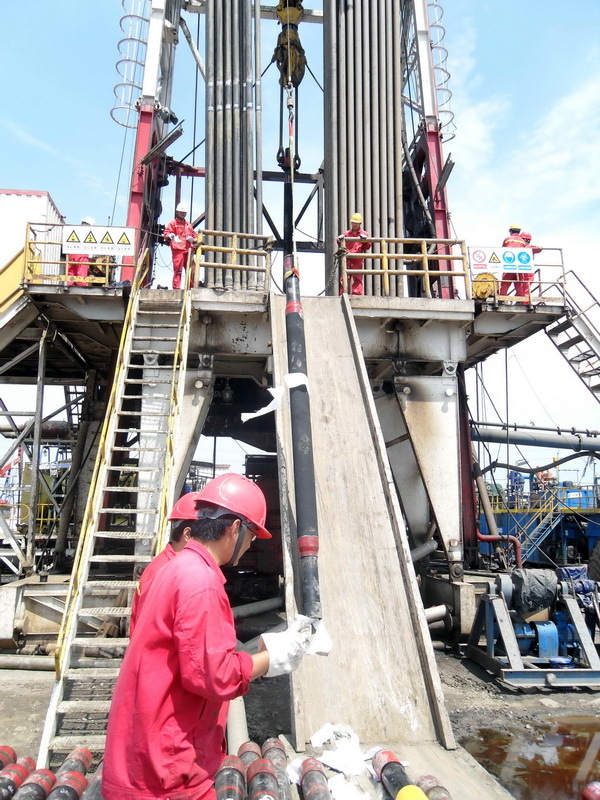 Normal oil drilling high-pressure hose can only be used in very few cases. 1). This kind of hoses have almost no tolerance, and they are capable of resistance to sand and water, light, small flexible and wear well. 2). All kinds of sand suction hose are made in suitable materials due to different purposes. 3). Abrasion resistance, weather resistance, and zone resistant. 4). They are logical designed, excellent quality, and durable. 5). We are the direct manufacturer. 1). Used in wind-pressured sand-spraying machine to get ride of the rust by spraying sand or with iron ball. 2). Widely used for sucking or discharge of water, sand, air, and powders in industry, agriculture, factory, mining and building ect. 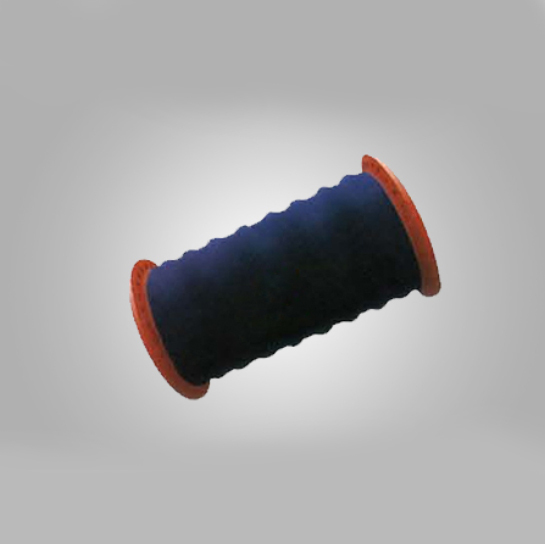 The steel flange suction hoses are used in dredgers for silt/gravels conveyance. Thickness of the pipe wall is from 31 mm to 58 mm. The suitable working temperature is from -20℃ to 50 ℃. It is convenient to install, flexible to use, safe, abrasion-resistant and bending-resistant. The steel flange suction hose is good enough to absorb shearing stress and would last life cycle of metals. 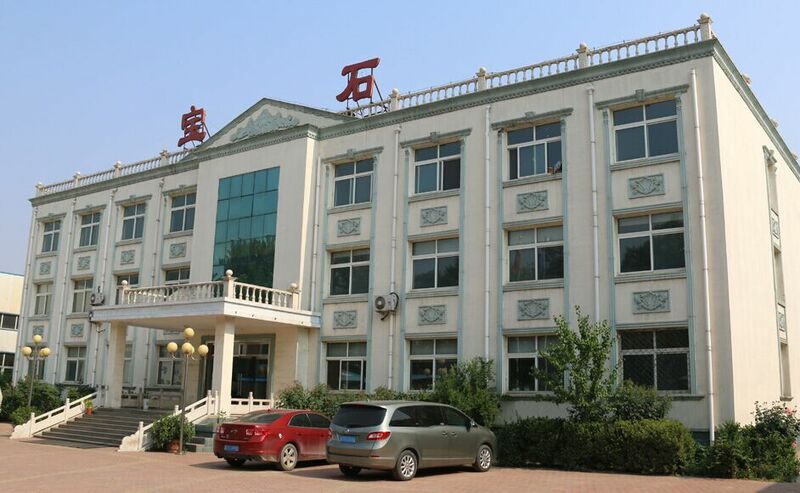 We ,Hebei Baoshi Special Flexible Rubber Chemical Industry Co., LTD,specialize in the field for more than 10 years, with the strength of RTP pipe, rubber hose, orging-casting integrally-formed union drilling hoses, high-pressure double-hook self-locking flame retardant hoses, oil/water self-inflatable packers (the above products are patent products), hydraulic expandable packers, wire spirally-wound hoses, high and low pressure wire braided hoses, flexible reinforced composite pipes, metal hoses, suction and discharge clay hoses, ripple compensators, high and low pressure unions, joint, packers, packer rubber, mud pump piston, seal products, etc. ; the company also produces relevant matching products, various fittings, clamps, rubber products, polyurethane products, silicon and fluoro rubber products, etc. 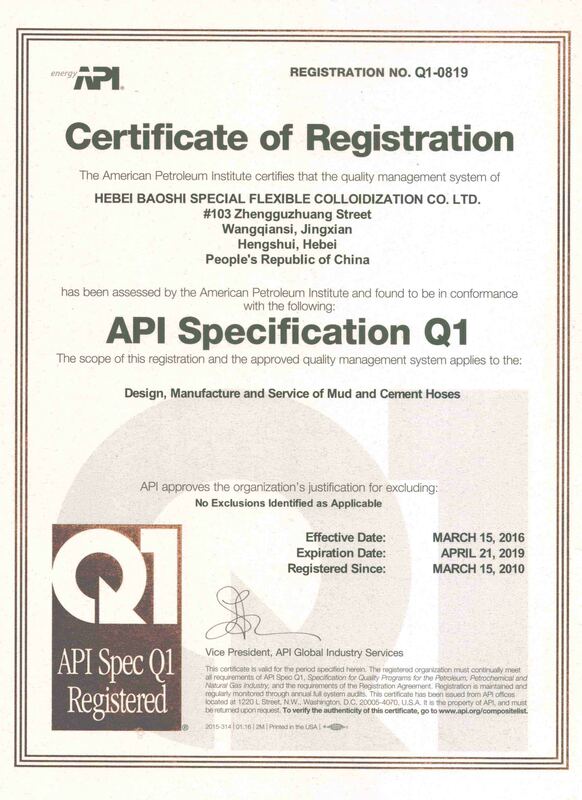 Our company has been managed strictly according to the demands of ISO9001:2008 and have passed API Q1 quality management system of American Petroleum Institute, the certifications of ISO14001 environmental control system and OHSAS 18001 vocational health cotrol system. HEBEI BAOSHI SPECIAL FLEXIBLE RUBBER CHEMICAL INDUSTRY CO., LTD.
Hebei Baoshi Special Flexible Rubber Chemical Industry Co., Ltd., a technology-innovation enterprise with a great capacity for designing and developing, manufacturing, marketing, and providing technical service, is specialized in producing various pipelines and Fitting parts for petroleum, petrifaction, metallurgy, machines, coal, and dredging engineering. Advanced technology, strict management and perfect service have formed the basis of our enterprise. 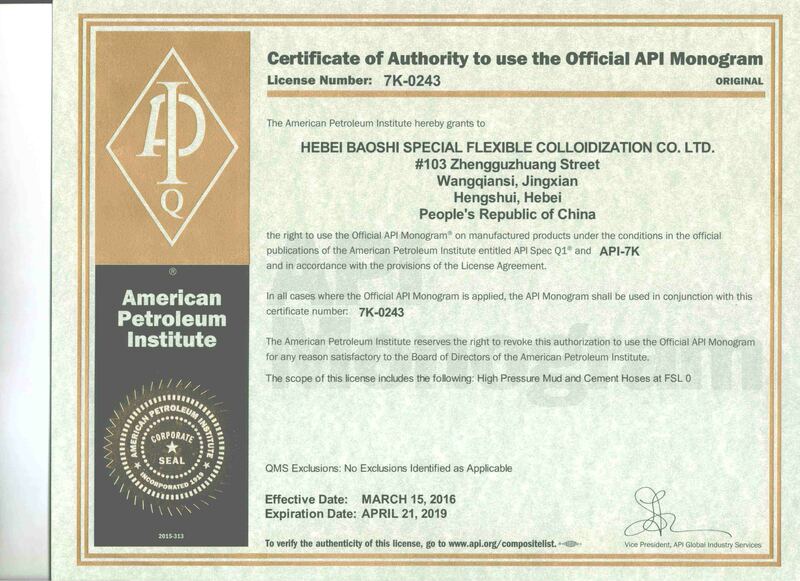 Since it was set up, our company has been managed strictly according to the demands of ISO9001:2008 and API Q1 quality management system of American Petroleum Institute, and has passed the certifications of ISO14001 environmental control system and OHSAS 18001 vocational health control system. Our company has a professional team in charge of designing, researching and developing. During the course of the development, always taking science and technology as the lead and taking the road of innovation, it has established cooperation with China Oil Prospecting Developmental Research Institute, Beijing University, Tianjin University. And it has signed the strategic cooperation agreement with the equipment department of China Oil Prospecting Developmental Research Institute. With our advantages ,we have successively developed new products demanded by the market. We also predict the needs of the market ,by thinking what our customers think about and being eager to meet our cuatomers need.Based on the domestic market and having the international market in view,we will strive for our further development . Main products :meet-water/oil expanding packer ,union-joint forged integral-type high-pressure drilling rubber hose,double-hook self-locking flame-retardant hose,steel wire spiral rubber hose,high/low pressure steel wire braided rubber hose,metal hose,mud draining and sucking hose,flexible reinforced compound hose,packer rubber barrel ,corrugated compensators, high/low pressure union and joint; Our company also produces correlated fitting products,various fitting parts,rubber products,polyurethane products,products of silicon and fluorine rubber,Besides our products of state standard, trade standard,and enterprise standard,we can also produce international standard products of API,SAE,DIN to meet various demands of different customers .With our sincerity and honesty ,we will try our best to supply our customers with best products and service. 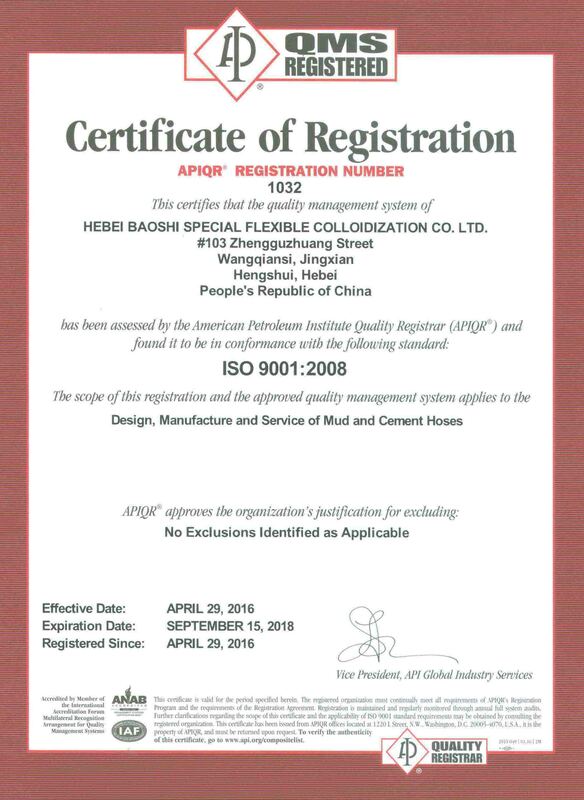 Company Name: HEBEI BAOSHI SPECIAL FLEXIBLE RUBBER CHEMICAL INDUSTRY CO., LTD.